The Chairman, House of Representatives’ Ad Hoc Committee on Fuel Subsidy probe, Farouk Lawan, while presenting the 210-paged Fuel Subsidy report to a plenary session of the House of Representatives, on the 21st of April, moved a motion of recommedation that two companies should be removed from the list of companies indicted by the committee for receiving forex from the Central Bank of Nigeria but failed to bring in the fuel. The companies, Synopsis Enterprises Limited and Zenon Petroluem and Gas Limited were removed from the list via a unianimous decision by the House. According to the list, Zenon is alleged to have collected the sum of $232, 975, 385.13 while Synopsis Enterprises collected $51, 449, 977.47 for the year 2010 and refused to import any oil. Both companies belong to billionaire and oil mogul, Femi Otedola. And Mr Lawan answered in the affirmative. 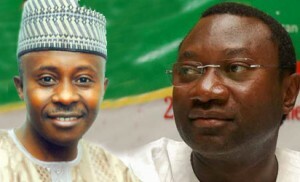 However, Mr. Otedola on the 11th of June, in an interview with a national newspaper alleged that Mr Lawan had demanded a $3million bribe from him, days to his (Lawan) presenation of the report, so that his two companies will be removed from the list of indicted companies. Mr Otedola in a sting operation, allegedly coordinated by the State Security Service (SSS), gave the lawmaker, the sum of $620,000 in part-payment for the bribe. Mr Lawan in a swift reaction on Sunday, denied accepting any bribe from the oil mogul. He however revealed the following day, that he accepted the money in ‘another’ sting operation involving the police authority. The House of Representatives, which has been on a one week recess on Wednesday, called short the break for an emeergency plenary session, to hold on Friday (15th June 2012). The House is expected to make its stand known on the scandal during the emergency session. I can’t believe mr integrity “farouk lawan” actually collected d bribe. That means he must have collected millions of dollars from other oil companies n marketers that we didn’t know off. This man deserves to be jailed. Mr intergrity Farouk lawan, you really beat ♏γ̲̣̣̥ imagination by collecting this huge sum of money as bribe to destroy my children future. If Jonathan will listen to me №ω, Farouk should sentence to 50yrs in prison. While Femi Otedola should bε̲̣̣̣̥ given 100yrs. And all their asset should be frozen. Atleastgovt. Should use the money to train my children in oxford. i dnt wnt to judge anybody but recover all d money to give nigerian free education,infrastructure to creat job opportunities to reduce crisis n agricultural development. The giver and receiver of bribes according to the efcc act are guilty. Whether the operation was sting or not both should go to jail and their ill gotten wealth frozen. In a country where we are lookink for a way to get rid of corruption an honourable member of the house of representatives collecting bribe this is ridiculous. This man man pay for what he did. God bless nigeria. What a loss, dat those who claim to be upright and just are the fraudster’s we have in the country. How can a man collect a bribe dat can feed millions of NIGERIANS, for his own selish interest. Anyway i suggest dat the both of them should be arrested and made to pay the penalty aswel as their ill-gotten wealth frozen. It’s a PITY. All unrighteousness is a sin, and the wage of sin is death. hun…un…un. Who amoung them is clean? Nigerian leaders are not ready to develope the country. Many discoveries of this nature that were made before now end up where? Nigerian laws against corruption can bite only the poor. Wait and see the end of this b4 you prove me wrong. IT IS NOT A LAUGHING MATTERS. I AM NOT A POLITICIAN BUT IN MY WIDEST DREAM I WOULD NEVER BELIEVE MR. ”INTEGRITY GROUP” BY ERROR OR DELIBERATE CAN BE A THIEF OF THIS NATURE. TO SERVE AS DETERRENT TO OTHERS, HE MUST BE JAILED. Does it mean that we (Nigeria) dont have HONEST PEOPLE in our midst again? When will this stop? What will happen to Mr INTEGRITY? Should it goin 2b a case of Bode George & co? I’m just TIRED of this Nation!!!! God I pray U help us when we will stil b dia.